Most Charlotte Mason homeschooling parents have heard of the McGuffey Eclectic Readers. I’ve had the complete set of readers for years, but only began using them regularly this year. I’ve always had a fondness for their older feel and technique of teaching, but to be honest, I wasn’t always sure what to do with them- other than just have the kids read them with me. That changed when we received Eclectic Foundations Language Arts Level B for review. 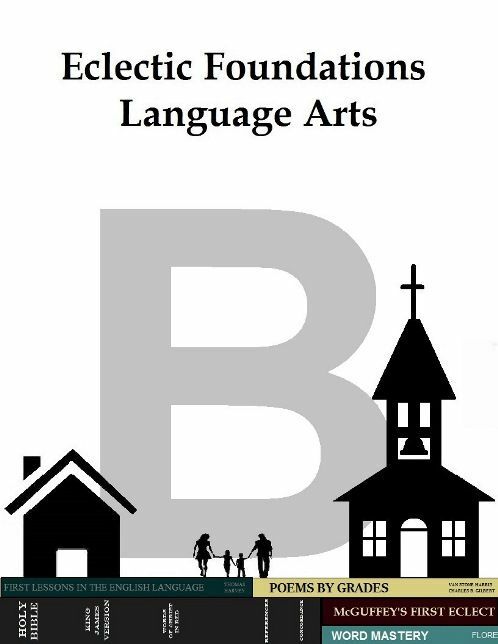 Eclectic Foundations makes a complete, old fashioned language arts curriculum that is built around the Readers. The complete curriculum is available in three different levels- A, B, and C. As I mentioned above, we received the level B set. The Word Cards are printed on cardstock and come 10 to a sheet. They aren’t perforated, but it’s easy enough to cut them out as needed. I really appreciate that the letters are big AND each card is labeled with level and lesson number. 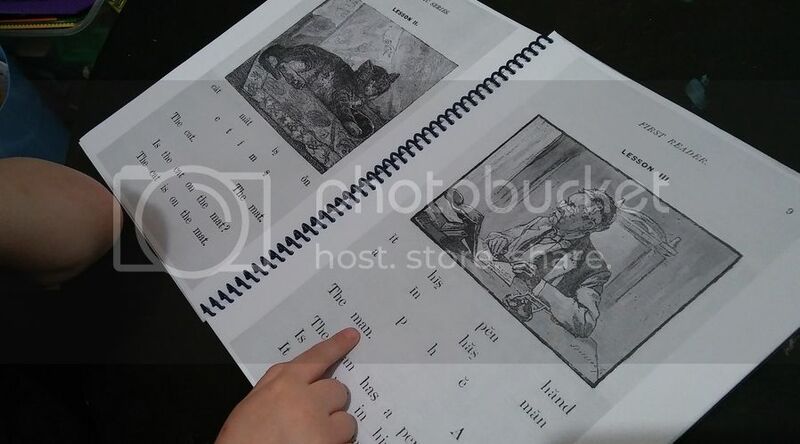 The Practice Sheets are laminated so your child can use them over and over. They are also available as a free digital download if you want to laminate them yourself. So what all is covered with Eclectic Foundations? 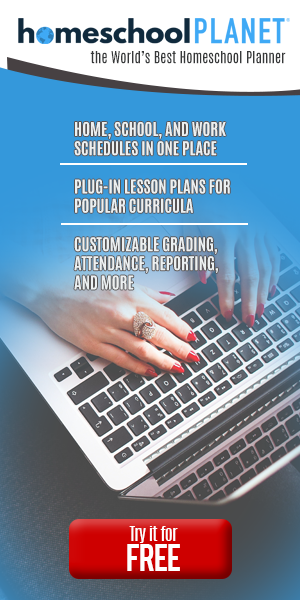 Everything you need for a full year language arts curriculum!! In just four short lessons a week, phonics, handwriting, grammar, and poetry are taught throughout the year. The phonics portion is pulled from Word Mastery by Florence Akin (available free online). The word lists are given at the beginning of each lesson. For example, lesson one’s word list is late, dime, hope, mine, cane, pure, gave, wire, wore, bite, pole, line. As you can see, level B starts with silent “e” words. I didn’t worry too much about having her spell the words, I treated them more like sight words. As long as she could recognize the words, that was good enough for me. She did write the words on her practice sheets and we used the provided writing pages in the Student Text for copywork instead of cursive. She’s only five so we aren’t working on cursive, yet. 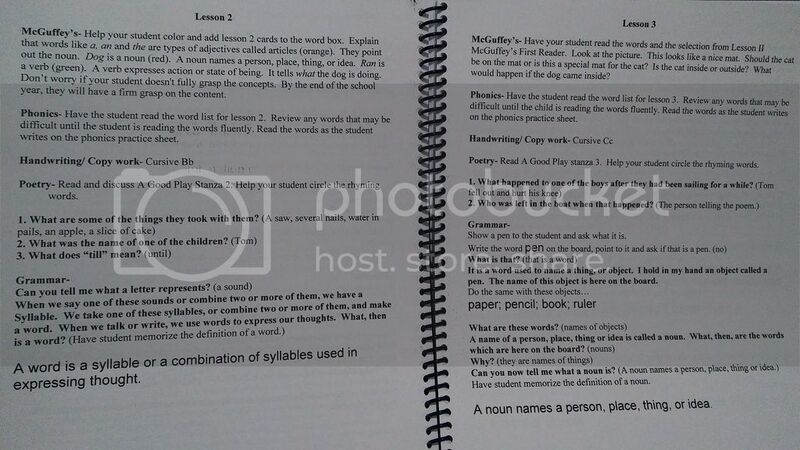 An example of the lesson layout from the Teacher’s Guide. 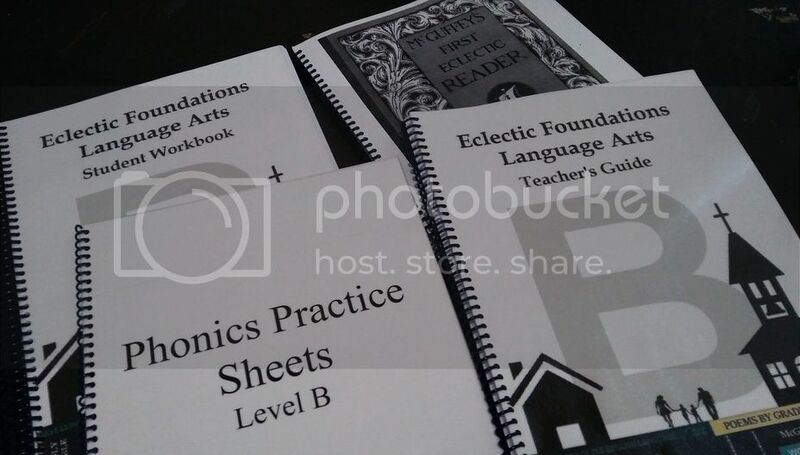 The McGuffey’s section covers about two lessons per week. One day is spent studying the picture and reading the words and the selection. The next day is for coloring word cards and reviewing parts of speech. Nouns are red, pronouns are pink, adjectives are orange, verbs are green, adverbs are yellow, prepositions are blue, conjunctions are purple, and interjections are black. The Student Book has a new poem for each week. Reading through the poems was one of our favorite things to do. We love poetry around here. Because the poems were usually a bit above her reading level, I read them aloud a few times until she could repeat me. We talked about rhyming words and used colored pencils to circle the different rhymes. There are some comprehension questions about the poems. The lessons are simple, short, and effective. There’s NO prep work for me!! We’ve been having a lot of fun with Eclectic Foundations. I absolutely adore the way in which information is presented. I LOVE that it’s all encompassing and there’s no extra work for me. I wholeheartedly recommend this old fashioned language arts curriculum to homeschooling families everywhere!